JAKARTA - After the series of earthquakes hit West Nusa Tenggara (NTB), the electricity conditions in NTB have not yet fully recovered. The Directorate General of Electricity at the Ministry of Energy and Mineral Resources (ESDM) has commissioned the electricity inspector to continue checking and supervising the implementation of the recovery of electric power installations affected by the earthquake beginning in early August (6/8)..
Now, the Lombok electricity system which supplies the city of Mataram is still not fully recovered. Meanwhile, the electrical system on Sumbawa Island, which includes the Sumbawa and Bima electrical systems, is mostly lit and safe, although there are some small areas the light is still off. A total of 9 teams of electrical inspectors have been dispatched in turn to continue to coordinate with PT Perusahaan Listrik Negara (PLN). Andi Winarno, the electricity inspector who served with the 5th team (15-18 August 2018) said he and his team must carry out the task of repairing distribution transformers along the slopes of Mount Rinjani. 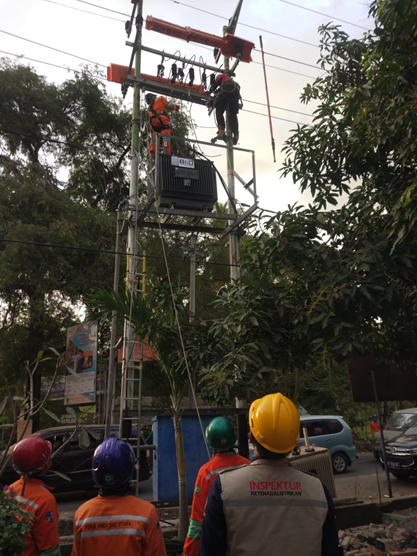 "Next we went to Tanjung District, North Lombok Regency, which was the most severely affected by the earthquake to monitor the process of repairing the distribution transformers and securing the installation of house connections and kWh meters," Andi told www.esdm.go.id, Monday (27 / 8). Andi revealed, when he arrived, a PLTMH and PLTU (LED) in North Lombok unit 1 went out and were under investigation for further handling. "When we returned home, the 6th team that replaced us reported a recurring earthquake, the peak of which was a scale of 7 SR on August 19, 2018 at 9 pm (WITA), which resulted in the extinguishing of several other plants, including PLTU (LED) unit 2," said Andi's . This was justified by the 6th team at the scene when the SR 7 shepherd again rocked Lombok (8/19). "That night we even slept outside. We were sure that many installations were off that night, and it was true that a big task was waiting for us the next day," Ahmad said. In a separate place, Yunan Nashikin, the electricity inspector who will soon depart to Lombok, revealed that the Directorate General of Electricity and PLN also formed a post at the Gatrik Directorate General's office in Kuningan, Jakarta. "The Command Post was formed to report on the daily progress of the Lombok / NTB system electrical condition and compile the NTB electrical condition report after the earthquake based on the report of the team on duty in the field," he added. According to data from the Directorate General of Electricity, when an earthquake occurred, several areas with electricity supplied by the Lombok System were still on, with a load of 50 megawatts (MW) with a 150 kilo Volt (kV) transmission network system still safe. This figure is still under normal day load conditions, namely 155 MW, and a night load of 220 MW.